Can You Eat Daikon Radish Greens? Christine Mathis is a writer, beekeeper and home gardener. Her work has included grant proposals, scientific abstracts, laboratory protocols and office work instructions. Mathis has a B.S. in broad field science and English literature with a minor in outdoor education. She is currently pursuing an M.F.A. In creative writing. Like a carrot, the small green leaves of a daikon radish support a large, edible root. Some daikon roots grow as large as 50 pounds, but the root is not the only edible part. You can eat all parts of a daikon radish, including the greens. Daikon radishes originate in East Asia, where the Chinese and Japanese cultures use the roots and the greens as part of their regular diet. Many people also use them to increase appetite, treat stomach ailments and as a daily supplement for good health. Many varieties of daikon radish exist, each exhibiting some variation in taste, root size, color and shape. The most common daikon radish has a large cylindrical white root. Because they produce a mustard-like oil, daikon radish roots and greens taste a little spicy. Daikon roots and greens store best when separated. If purchased in a bunch, just cut the greens from the roots and wash them with cool water. Allow the greens to drain or dry them in a salad spinner. Place the greens inside a plastic bag or a glass jar inside the refrigerator. To keep them crisp longer, add a moist paper towel to raise the humidity inside the storage container. Fresh greens can keep up to a week under optimum conditions, but they may begin to wilt and yellow within a few days. Prepare daikon greens in a variety of dishes and incorporate them into your diet as often as desired. Use daikon sprouts or small raw daikon greens in cold salads or on sandwiches. Chop and lightly steam larger greens to add to cooked vegetables or rice or pasta dishes. Add raw chopped greens to hot stir-fry, soup or rice and wait a few minutes before serving. Daikon greens can also work as a substitute for cooked spinach, kale or chard. Low in calories, daikon radish greens contain high quantities of several vitamins and nutrients including vitamin C, potassium, vitamin A and manganese. They also provide some calcium, iron, fiber, vitamin E, vitamin B-6 and magnesium. Eat daikon greens raw or lightly steamed to avoid nutrient degradation and the addition of fats in the cooking process. 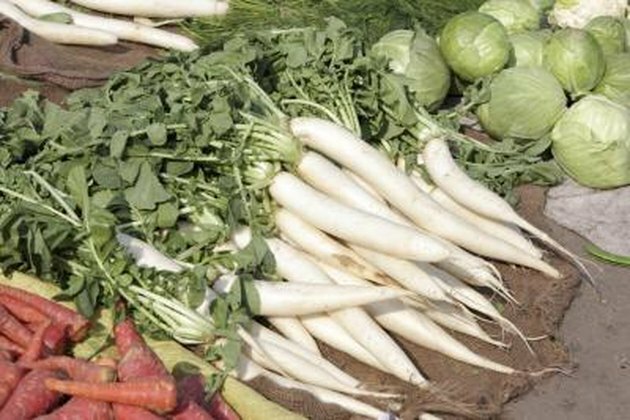 As a type of cruciferous vegetable, daikon radish greens also offer cancer-fighting compounds, called glucosinolates. What Are the Benefits of Eating Beet Greens?